Open Telecom initiatives continue to grow, as the benefits of belonging to NFV ecosystems are so compelling: working together, private cloud infrastructure, software and systems vendors are helping service providers "future proof" their networks and improve service agility, while avoiding vendor lock-in and continuing to build the basis for the development and launching of new and innovative services. The telecom community has long been one of the best massive global industries to successfully tackle the "inters" - interop, interconnection, interworking and of course- the Internet. It took a few decades for us to create the physical network infrastructure, to stand up the operating and billing systems, and to create not only massive superhighways through fiber optic backbone networks, but on and off ramps, as well as air traffic control as more and more real-time communications moved to cellular and other mobile networks. As we now move into the 5G era, where “Things” will talk to each other and to humans, it is going to be even more challenging for network operators and service providers to keep up with their need to invest capex and opex to stay competitive, not to mention having to manage legacy to leading-edge transformations through the transition. It was an inevitability that, as the ocean of real-time communications rises, the only ships that will rise with all that opportunity will be those who can throw the heavy metal machinery overboard, and adopt a "starship" mentality, running their networks via cloud-based, software-driven platforms. GENBAND has always been in the disruption business, and today we are more positively disruptive than ever, a leader in moving our network functions to a virtualized state (including our Session Border Controller, Advanced Media Software, Call Session Controllers, Application Servers, WebRTC Gateways, Intelligent Messaging) while also building cloud services from the ground up - and all these work together. But more important than our own internal R&D, and equally creative and exciting, are the ecosystems we are very active members of. Ecosystems that are thriving and making it so much easier for our collective customers to tap into, moving their own networks forward into a digitized state, without the same cost, risk and headaches associated with previous legacy network functions. It is not easy running massive global networks with millions of subscribers, consumer and enterprise, and having to serve them even as you are "evolving" a network from one era to the next, while technology, devices and applications is enjoying explosive growth all around you! Next week, at Perspectives17, our awesome annual customer and partner event, we will be highlighting the services we have built for and with our ecosystem partners, and the venue is perfect given that this event, now in its fifth year, brings the most successful and visionary leaders across telecom, systems integration, software and applications, and vertical enterprise solutions together in a very "cross-fertilized" way. It is truly an ecosystem event. 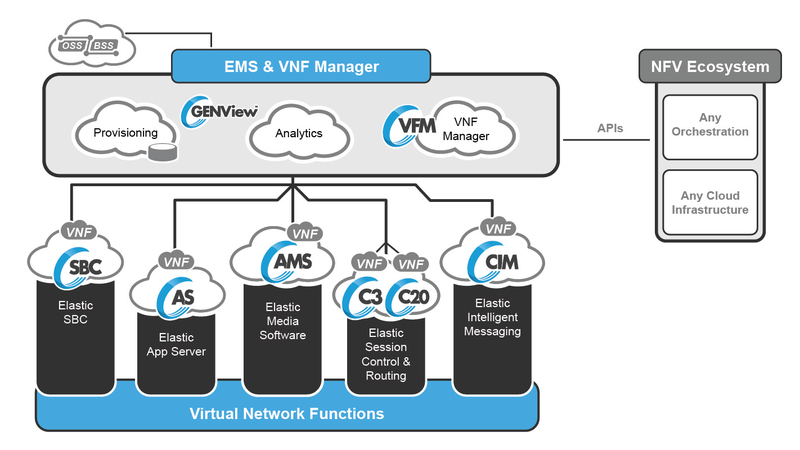 GENBAND’s micro-services based Virtual Network Functions (VNFs) are integrated in several NFV ecosystems including HPE and Canonical and the company is working closely with other NFV ecosystem partners including Intel, Wind River, HPE and Kontron to bring differentiated solutions to market. We will be sharing a big announcement about the growth of our ecosystem during the event, while also hosting some of the greatest thinkers and developers in our industry to present keynotes and contribute to panels on the latest trends in NFV and service providers' transition to the NFV Telco Cloud. We will also spotlighting the RTC applications that run on that same NFV Telco Cloud (from our Kandy Business Services to other company's solutions based on Kandy "Wrappers"), including Converged Intelligent Messaging, over-the-top voice and video collaboration applications, and more. Finally, we'll be revealing even more functionality and advanced software available as part of our VNF Manager, and also what we believe is the most feature-rich Predictive Analytics and Element Management capabilities that turn an "intelligent" network into a "genius" one. Thanks for continuing to follow us as we move forward at warp speed with the industry, with our ecosystem partners, all in service of the customers we share and the businesses and consumers they serve; sign up for announcements including the NFV Ecosystem Partner announcement we'll be making while in Los Angeles, and, of course, join us for "LA LIVE" where the networking will be vibrant on many levels.